Help! 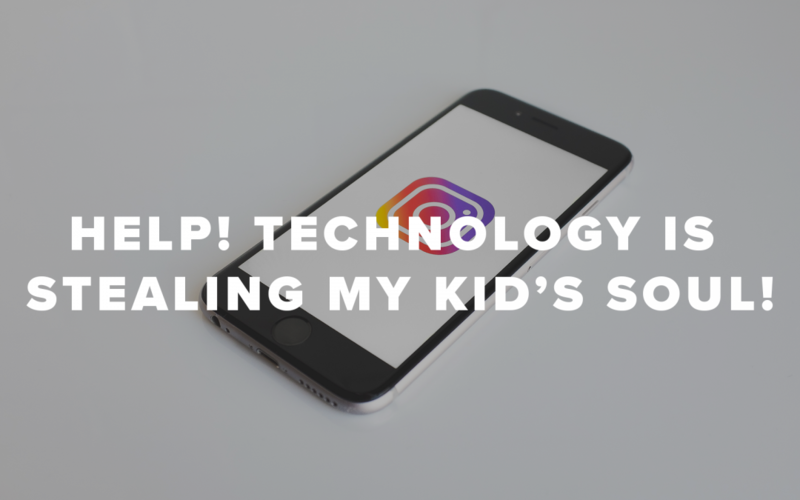 Technology is Stealing My Kid’s Soul! You’ve heard the stats. You’ve heard the warnings. Our kids consumption of screen time is turning their brains to mush and their souls to wastelands. BUT… on the other hand… much of their school work and recreation is now online, plus that’s the way they communicate, and truth is that’s the way WE often communicate WITH them. What’s a parent to do? Take away the phones? Not always practical. Shut off the wifi? Hello… cell service! Just give in… not yet. At the risk of making you seem like the meanest parent on the planet, here are a few lessons we are learning that might help. Before we get into technology hacks, let’s set some boundaries. We have let our kids know that as long as you live under the roof I pay for, and use the phone I bought, and enjoy the wifi I provide… then I’m the owner. I get to determine how you use the things I offer. So, just know that I reserve the right to take your phone for a period of time. I have the ability to look at your phone. I will know the password or have my fingerprint on your phone. I love you. And that’s why for now, I’m going to make the rules. One day you’ll be the owner. But not yet. 2. Computer and phone use in public space. While our kids had old iPhones they could use for music and limited texting via wifi, we decided to hold out on phone service until they turned 13. And that was only for our ability to communicate with them when they were at school or a friend’s house. Social media sites such as Instagram were not allowed till 13 and at this time we still don’t allow Snap Chat. By limiting their accessibility to these sites you are allowing their minds and their trustworthiness to grow and develop before they are inundated with so many choices and temptations. If our kids are going to be on social media, we will be friends. I will follow them. That is non-negotiable. And for a period of time, we had to approve anyone they followed. Especially boys. Recently one of our daughters was contacted by a boy from school who was requesting a photo. I was so proud of my daughter for bringing it to me immediately. This made it easy for her to then blame it on me when she said “My dad said I can’t direct message boys.” So take that! By far and away, this is the most valuable technology tool that is out there. This app allows you to determine how long your kids can be on their phones, what apps they can and cannot use, and when they can use it. When it comes to the girls having their phones in their rooms for alarm clocks, we can do that because at 8:30 at night all of their apps shut off except the alarm clock. Our Pact app allows you to do this. Another great app, Kids Media, allows you to read up on movies, TV shows, games, websites and even books. This is very helpful when your kids say “I want to watch this movie on Netflix”. In about 5 minutes you’ll know how “age appropriate” their idea is. How much time? Up to you. We go with 2hrs total screen time a day for now. That includes TV and phone. And with Our Pact, you can even control how long the phone can be used. Michael Hyatt on his podcast shared this information about how to view technology: Ask yourself “Where are you NOT, when you are engaged on technological devices.” Technology shrinks our world and speeds it up. So ask yourself “When is that helpful for you or harmful for you?” Technology is a wonderful tool, but if not careful it can be destructive as well. So ask, when is it useful… and when is it harmful. These are just 7 ideas. And by the time you read this, technology may have advanced so much we have to come up with new ones to protect our kids. There is always more to learn, and I’d love to hear what ideas you have. Thank you !! The our pact app is a great idea .